Sugar Man wins his heat of the Canberra Cup. PIC OCIC Photo Tours/Lance Fearne. 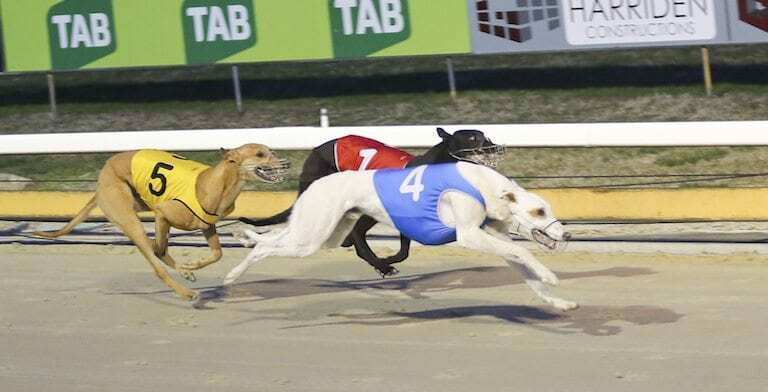 CLASSY white and fawn greyhound Sugar Man (Cape Hawke x Irish Marina Feb ’14) will be aiming to deliver an upset victory when he lines up in Sunday night’s Listed Canberra Cup. Trained at Harden, a town in the South West Slopes region of NSW, Sugar Man is prepared by 73-year-old Graham Thurkettle and qualified for the final when scoring a come from behind victory in his heat over the weekend. Clocking 30.97 for the 530m trip, it was his second straight victory after racing through a form slump in recent months, with Thurkettle pleased his charge has found his best at the right time. “He just went off the boil for a while and then we found he had a bit of a crook hip – once we got him right he started running well again,” Thurkettle told Australian Racing Greyhound. “I was very happy with his run on Sunday. Going into the race I gave him a good place chance but I wasn’t expecting him to win. The win took Sugar Man’s record to 23 wins and 32 placings from 86 starts, with his prize money now closing in on $30,000. He has been a very handy greyhound for Thurkettle, who also owns and bred the litter, having won on seven tracks throughout his career including Wentworth Park where he posted a slick 30.17 victory back in May. “He has been a very good dog to us. He is no champion but he is honest and he is a very good chaser. “We bred him ourselves and his mother Irish Marina has been a very good broodbitch – I raced her and she actually competed in a heat of the Canberra Cup although she wasn’t able to make the final. Six heats of the Canberra Cup were run on Sunday night, with time honours going to Jodie Lord’s Bombshell Bandit (Collision x J’S Robin Jul ’15) in 30.48. Lord won three heats, also qualifying Champion Model (High Earner x Clay Model May ’15) and Zambora Cross (Barcia Bale x Benden Snap Jan ’15) through to the final in 30.49 and 30.62 respectively. The remaining heats were taken out by SA greyhound Striker Klinsman (Dyna Tron x So Faithful Mar ’14) in 30.51 and Walkaway Bonnie (Dyna Lachlan x Walkaway Jackie Feb ’14) in 31.01. The two fastest seconds Rohan Hill (Brett Lee x Cawbourne Whip Mar ’15) and Hukanui (Kelsos Fusileer x Daddy’s Muffin Feb ’14) will also line up in Sunday’s $15,000 to the winner feature. Thurkettle concedes his greyhound will face a tough challenge from box two, but says he knows he will be giving it his all. “He has drawn box two in the final which doesn’t suit him, but you can only take what you get. “He isn’t a flash beginner anyway, so hopefully he can just stay in touch with them and get a run through in the early stages.